It's no surprise that I love science. I love the process, I love the sense of discovery, and I love how new theories ignite my imagination and expand my view of the world. And I love PBS. They air many educational shows that I record on the downstairs DVR and then watch when I'm sweating away on the evil machine of torture. Frontline, Nature, Nova, Bill Moyers, I love them all, and frequently I'm exposed to ideas or theories that spark my interest and drive me to learn more. Early bipeds starting walking on two legs because walking on two legs instead of four requires a much lower energy budget. Early bipeds became successful hunters by using a technique called persistence hunting, which essentially consists of running your prey to exhaustion. The ability to sweat was key to this ability, because it allowed early hominids to become effective long distance runners. The reason modern humans have so little genetic diversity compared to other species is because we are all descendants of a very small population that managed to survive an almost-extinction event. Neanderthals were really carnivores, not omnivores. Neanderthals and Homo sapiens walked the earth at the same time, but probably didn't interbreed. Instead, we had a common ancestor - Homo heidelbergensis, who gave us both the ability to have language. Homo sapiens probably beat out the Neanderthals for survival due to our incredible ability to adapt and use our environment in an intensive way. Not to mention our ability to go forth and multiply. Watching these episodes is probably the most intellectually exciting thing that's happened to me this week. Which just goes to show that yes, I am in fact a big dork. Well, yeah...but we like dorks! Hmmm, I thought someone had found evidence of Neanderthal genetics in the modern human genome. Going to have to look that up, might be just a theory as yet. John, don't be silly. All evidence points to the Neanderthals being relatively civilized social beings with a culture of their own. John, actually the tests have proved that we don't have Neanderthal lineages. The only similarity is because of our common ancestor. After all, we share a lot of genetic code with chimps as well. Since we would be closer to the old unibrows (heidelbergensis is closer to us than we are to our common ancestor with the chimps), we would naturally have more code in common. I believe the study you're thinking of showed that comparison (as in we have something like 99% similar code). Steve, that was essentially what the Becoming Human episode posited. I believe the research was done at the Max Planck Institute, but I could be misremembering. I am here to tell you that "dorkism" - is that even a word? - runs in the family. It comes with the "x" chromesone. Mom in Northern, oh snap! Good thing for both of us I prefer dorks and weirdos. 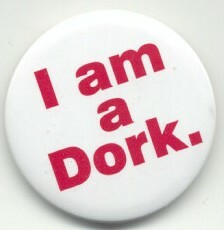 I am then, a Big Dork also! I LOVE these programs. Evolution ahoy! I can watch ONLINE!!! Work will not be accomplished this week. Apparently I also LOVE exclamation marks! Who would have guessed! And the jam is GREAT!! !1!